Alaska may be the worst place to live for poker players. There are no casinos in Alaska and there are no casinos close enough to drive in Canada. Alaska players will need to catch a flight for their closest poker game. Players may fly to Washington State or Las Vegas from major airports. The only other option is to find a way onto a cruise ship. Is Online Poker Legal in Alaska? Online poker is neither legal nor illegal in Alaska. 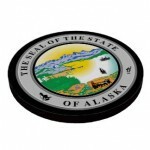 Poker players located in Alaska that have internet access will be able to play online poker. However, if you’re not located in one of the major cities this may prove difficult regardless. As of right now, the only thing remotely related to gambling going on in the state is the running of their lottery and bingo operations. Bovada, the largest online poker room to accept Alaskan poker players, offers a number of deposit options. It peaks at about 2,500 cash game players each day. Currently, Bovada offers a 100% up to $1,000 first deposit bonus that clears at about 30% rakeback. There is also a program where players may exchange points into tournament entries. Bovada just launched Zone Poker, which is a faster paced game that moves players to a new table after folding. If you hate waiting for a hand to complete then Zone Poker is perfect for you. It is the only game of its kind available to Alaskan poker players. One feature of Bovada that annoys some players is the lack of usernames at the table. All seated players display only a number. This makes it hard to make poker playing friends. It also makes it hard for serious poker pros to find games because all full Bovada games are hidden in the software, but also pretty good for beginners and novices who aren’t looking to lose their deposits too quick to the sharks. Alaskan online poker players looking for a more social game should also consider playing at Carbon Poker. While the game selection is lower, Carbon Poker offers a VIP program that puts what Bovada offers to shame. New players will receive a 200% up to $5,000 first deposit bonus and monthly reload offers. There is also a Royal Flush bonus where a player will win 100 times their big blind if the big hand is made using both hole cards. There is also a monthly tournament leaderboard and hundreds of thousands in tournament guarantees each week. The game selection and game quality at Carbon Poker pales in comparison to Bovada so players may wish to sign up at both rooms to find out which one caters to their needs. Outside of home games, there is no place to play live poker in Alaska. Poker players will have to head to the closest major airport and head to Washington State or Nevada.